If you run the terminal in VSCode on Windows, and the command is not recognised, make sure that the Path environment variable includes the following path: C:\Users\user.name\AppData\Roaming\npm. Also, make sure that this entry is at the beginning of the list because your path list can be too big for the VSCode Terminal to handle. This can be determined by typing echo %PATH% in your terminal window, and comparing it with the external cmd.exe window. 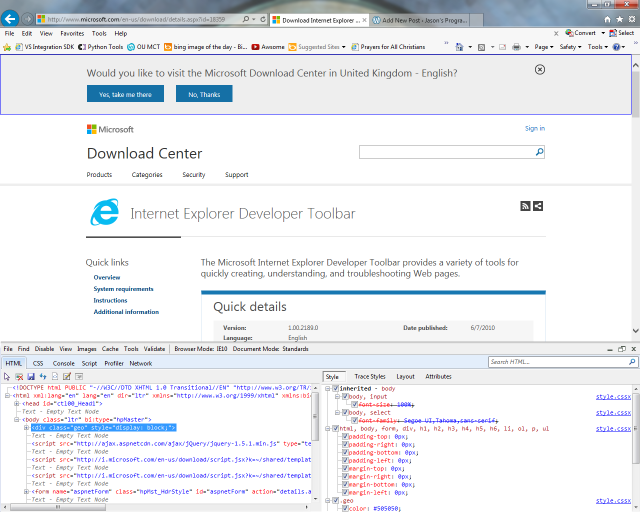 If you are a web developer and would like to know how certain websites are put together, or you want to debug your own website, then there is a good little tool for you to use in Internet Explorer. The Internet Explorer Developer Toolbar provides a number of different tools for viewing markup, css, scripts, providing link and image reports, and for validating a web page against various standards. The sample code below shows how to put one layer behind another using css. The parent layer contains the image. The child layers contains the text content. In the head you will notice that there is a style for the child layer, and the only setting in it is the position attribute. The position attribute is set to absolute positioning. It’s that simple. The above code produces the output below. When setting the z-index you may not get the behaviour that you expected. In order for the z-index to work, you also have to set the position attribute. I discovered this when redeveloping our company website. The z-index would not work. I then set the position attribute to relative, and hey presto! It worked. When faced with problem websites that do not render as they should in different browsers, there are three sets of debugging tools that are at your disposal. The tools are FireBug which is a FireFox plugin, the IE9 Developer Tools, and Google Chrome’s Developer Tools. Each set of tools has its own set of useful features. Another thing to be aware of is that Opera does not like empty strings. To get round this, place a space inside the double quotes. When developing new websites that simple work in all different browsers with graceful degradation, I suggest using Google Chrome Frame and HTML5 Boilerplate.